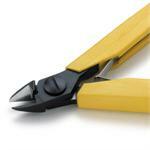 Look to C R Hill for a large selection of Jeweler's Pliers. Anything from bending, Nylon Jaw, and Specialty Pliers. We also carry both high end and economy brands. Whatever the job you need to get done, we have the plier for you.